Eltronicschool. - This is one application of TDA0161 IC to build metal detector for you who want to get useful with this circuit. It is very true that the main component in this circuit is TDA0161 IC beside the other component needed like inductor to sense the metal easily. In here beside we will give you the circuit schematic of metal detector using TDA0161 IC, we also will give you the global description of this circuit like also component needed in this all circuit and the last we will give you the link to take read more from original source. Circuit schematic like in Figure 1 above is Metal Detector using TDA0161 IC. This circuit is represent the one of the application of TDA0161 IC for you. Accordingly the Electronichub site that also published this circuit describe that TDA0161 Proximity Detector IC: TDA0161 is a Proximity Detector IC manufactured by STMicroelectronics. It can be used detect metal objects by detecting the slight changes in the high frequency Eddy current losses. 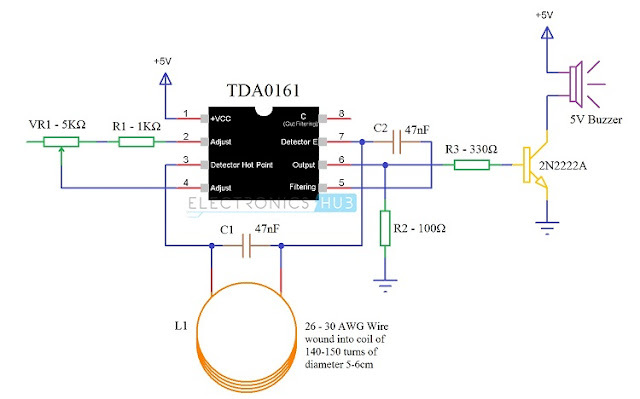 The TDA0161 IC acts as an oscillator with the help of externally tuned circuit. The changes in supply current will determine the output signal i.e. current is high when a metal object is near and it is low when there is no metal object. TDA0161 has 8 pins and it comes in Dual in – line Package (DIP). The following image shows the pin diagram of TDA0161 IC. NOTE: According to STMicroelectronics, TDA0161 Proximity Detector IC is obsolete. If it is available in the market, go ahead and make this fun project. If it isn’t available, try to find a replacement IC. We will try to update if any similar IC is available. If you find any Proximity Detector ICs, please mention it in the comments section. For more reading here. Wow, wonderful blog structure! How lengthy have you ever been blogging for? you made running a blog glance easy. The entire glance of your website is wonderful, let alone the content!